Lately in the news there’s been a lot of buzz about the Orion rocket. This post, however, is about the constellation and, unlike the rocket, is already in space and will be there pretty much forever, although with the passage of time, he’ll look a little different. But that’s a whole ‘nother topic for another time. Winter’s chilly skies offer an excellent opportunity to view this bright constellation. When he rises in the east, he almost looks as if he’s climbing a hill, until he reaches the midheavens, and then he starts his journey back down into the west. Right now’s the best time to see him, and he’ll be up right until spring. Orion’s got plenty of company, too. In his patch of the sky, some of winter’s brightest stars and constellations gather in his neck of the woods. His shoulder (pictured in the upper left hand star in the above rectangle) is Betelgeuse, and his lower right hand foot is Rigel. You can trace a hexagon going up to the right and a touch north to the “V” shape that is the head of Taurus, and the brightest star in the “V” is Aldebaran. Next, cast your eyes up and over slightly left and you’ll come to Capella, the eye of the charioteer Auriga. Going left in almost a straight line, you’ll come to the stick figure twins, whose heads are Castor and Pollux, which are actually the Gemini twin’s names. Next, drop your gaze a little south and to the left and you’ll come to Procyon, the very bright star of Canis Minor, or, the Little Dog. But his big brother, Canis Major, or Big Dog, hosts the brightest star in the sky, Sirius. His basic shape is also a thinner rectangle, and you can easily find Sirius if you trace a southwest path using Orion’s belt as a pointer. Even if you have trouble finding each of these stars on the first try, you’ll notice that this section of the evening sky stands out more than others, and if you go to this site, you’ll find an explanation and some tips on locating these and other favorites. A constellation as grand as Orion simply won’t stop at dominating the winter sky. It’s what’s inside him that makes him even more fascinating. 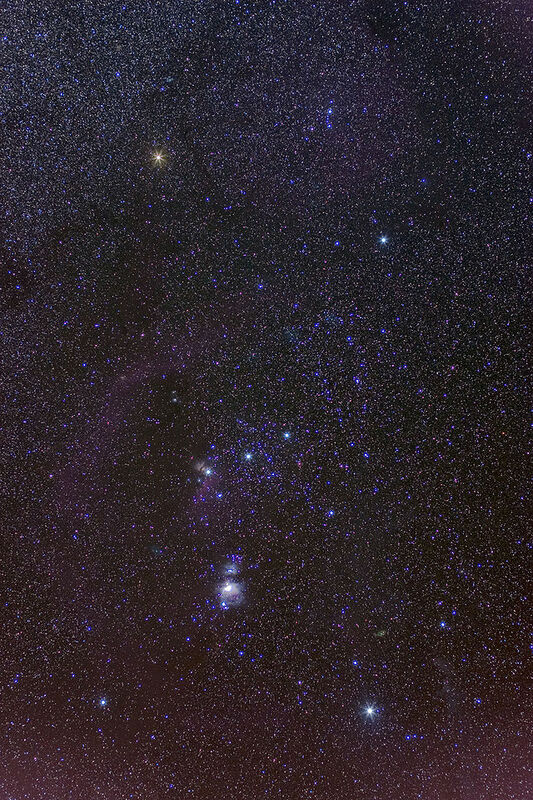 Look at the picture above and you will see an “N” in the lower half of Orion’s depiction. That’s the Orion Nebula, and although a bit faint, on a clear winter night you should be able to make out a tiny hazy patch. Even with typical field glasses the details of it come out clearer. What makes that nebula so remarkable is what it contains. A solar system nursery is there, wherein a collection of youthful stars and planets in the forming stage are present. The New York Times has an excellent article and a wonderful video detailing the action swirling around in Orion’s belt. So don’t just sit there! Put on a jacket, go outside and look up – you’ll be rewarded with heavenly treasure, free and yours for the taking.